Natural disasters like Cyclone Winston in Fiji have the biggest impact on children, who are among the most vulnerable members of society. 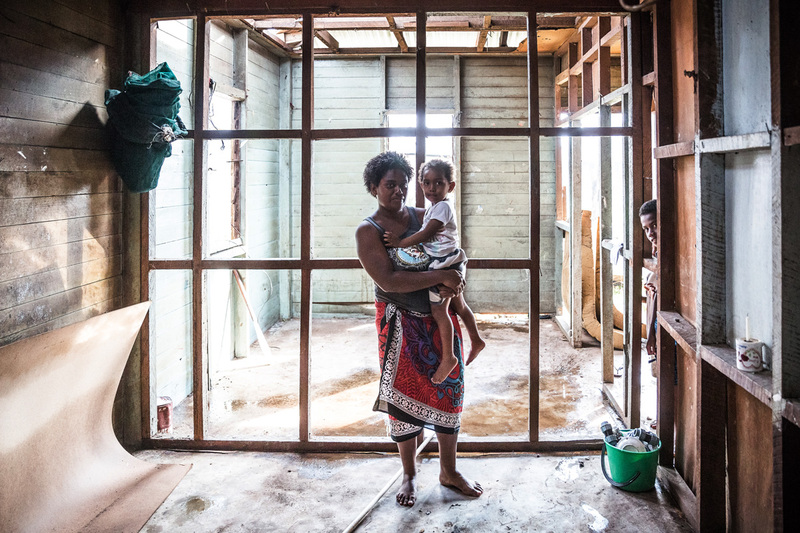 This was certainly the case for 3-year-old Tuvosa (pictured above) when the cyclone tore his family's house apart, on Viti Levu island. "We lost everything," his mother Kalisi says. "We don't have a house, and there is no food. During the cyclone me, mum and Tuvosa were hiding under the bed. My husband was holding the wall." "When my soon realised what had happened to our house, he cried," she continues. "Since the cyclone, he has not been the same. Every time he comes back home he cries. He barely talks to us. I think it has really affected him." Eta, 31, sits with her son Alipate, 1, who is recovering from chicken pox. The family have taken shelter at their local village school, on Viti Levu island, which is being used as an evacuation centre. 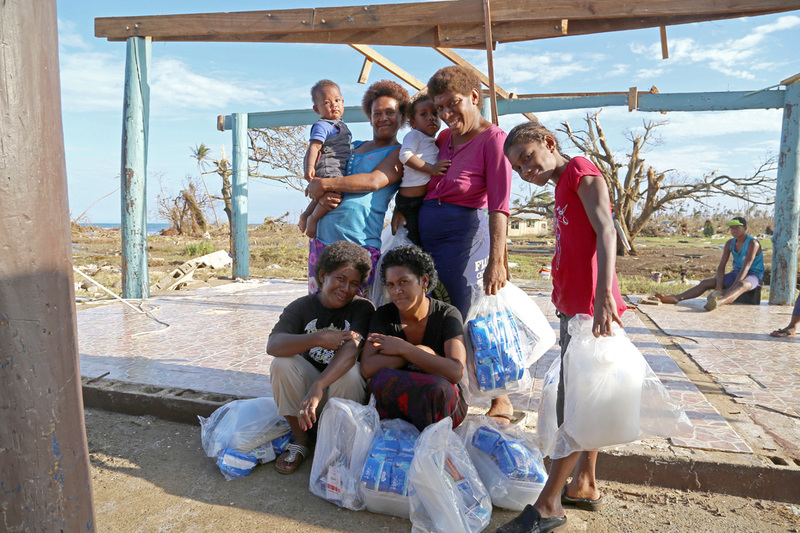 They survived Cyclone Winston by huddling together in the only standing bedroom, after the storm blew the rest of their house away. "We sat in the rain for hours until we could get to an evacuation centre," Eta says. School has been cancelled for one week across Fiji. Some 67 schools have been destroyed or severely damaged, while others are being used as evacuation centres. Over 22,600 people are in 246 evacuation centres, with many more staying with relatives or in other non-official displacement sites. In the north of Viti Levu, the largest island in Fiji, the once lush vegetation that covered the banks of Rakiraki River has gone. But that doesn't stop children and young people from nearby villages swimming and playing in the waters. 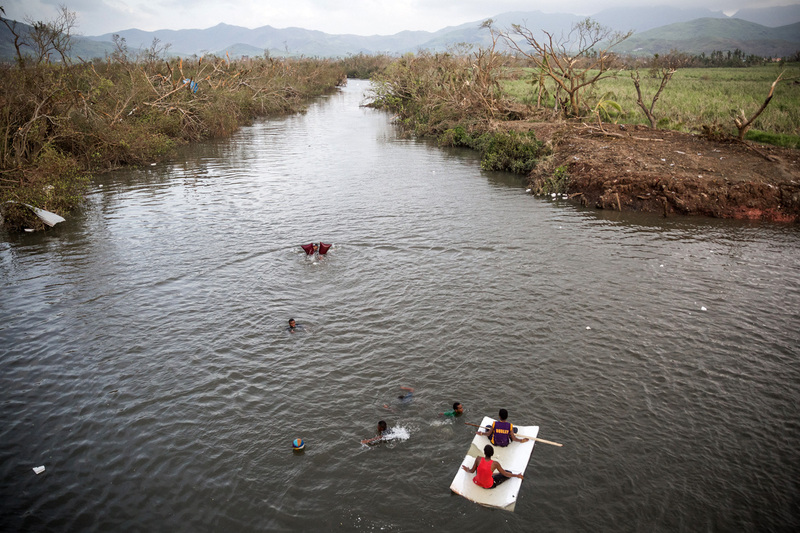 Here, two boys have turned part of a cyclone-destroyed house into a makeshift raft. Category 5 Tropical Cyclone Winston was the strongest cyclone to ever hit Fiji. On landfall, it had some of the highest wind speeds recorded globally. It struck the two main islands of Fiji and numerous smaller islands. Around 40 per cent of the population of Fiji live within 50 kms of the eye of the storm. In Ra Province, Viti Levu island, Kolora, 26, holds her daughter Semaima, 2, in the ruins of their house. In many villages, mothers and children can be seen drifting in and out of the skeletons of what used to be their homes. So far, there have been 44 confirmed deaths from the cyclone, including three children, with numbers likely to rise. 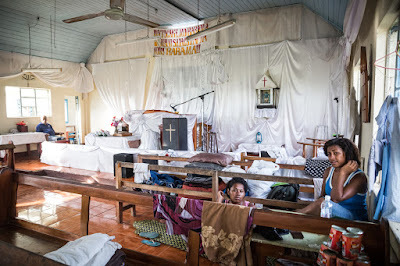 As well as schools, churches are being used as evacuation centres, with children and their families sleeping on the pews. Here, Micola, 18, and Lusiana, 17, enjoy a rare moment of peace and quiet at an evacuation centre in a church in Ra Province, Viti Levu island. 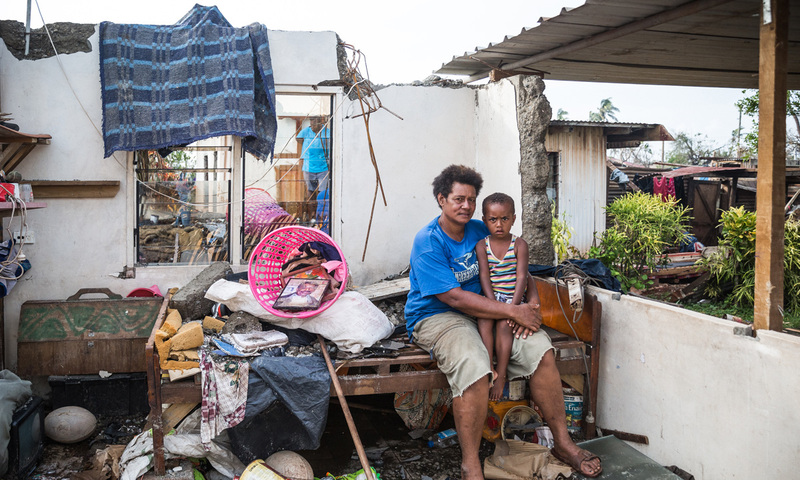 Across Fiji, families are sifting through the debris of their lives and trying to rebuild. In times of devastation, communal living is widespread. 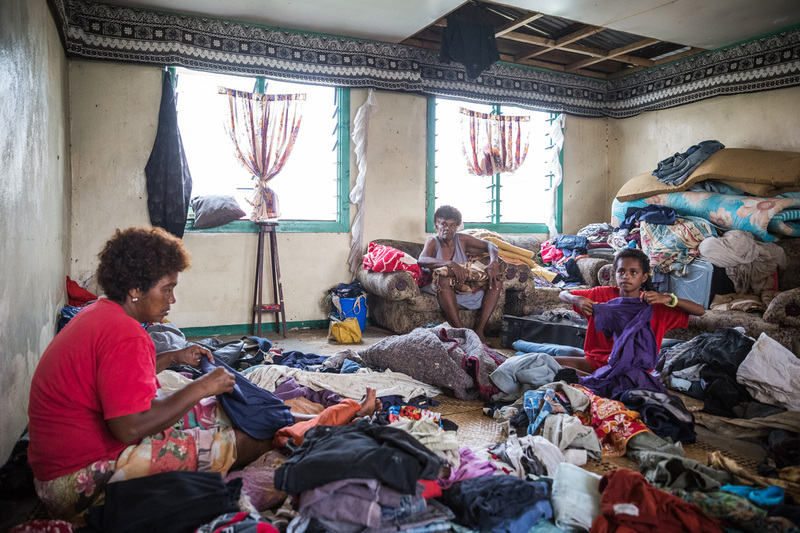 Here 10-year-old Lusiana (right) helps her grandmother and aunt sort through and fold clothes for her family in Rakiraki village, Viti Levu island. 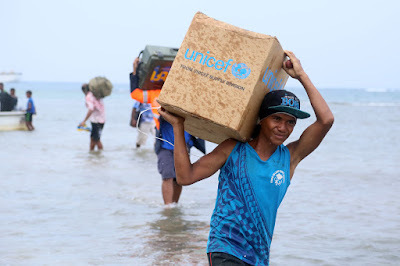 UNICEF supplies being offloaded from The Iloilovatu, a chartered vessel that Fiji Government arranged to carry emergency relief supplies to Koro Island, one of the places worst hit by Cyclone Winston. The supplies include water, sanitation and hygiene kits. They were transported to shore in small outboard motor boats at low tide. Villagers and emergency response workers worked together to carry the urgently needed relief supplies to land. 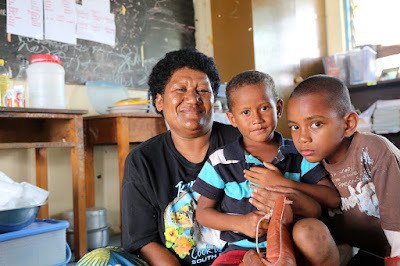 On Koro Island, Vonevatevetaqula Kim shares the frightening story of how her grandson, Suliatonga almost got swept away by the storm surge following Cyclone Winston. At Nasau village, women wash their remaining clothes in the river – the only available water source. Upstream from where the women are washing, villagers are collecting drinking water. 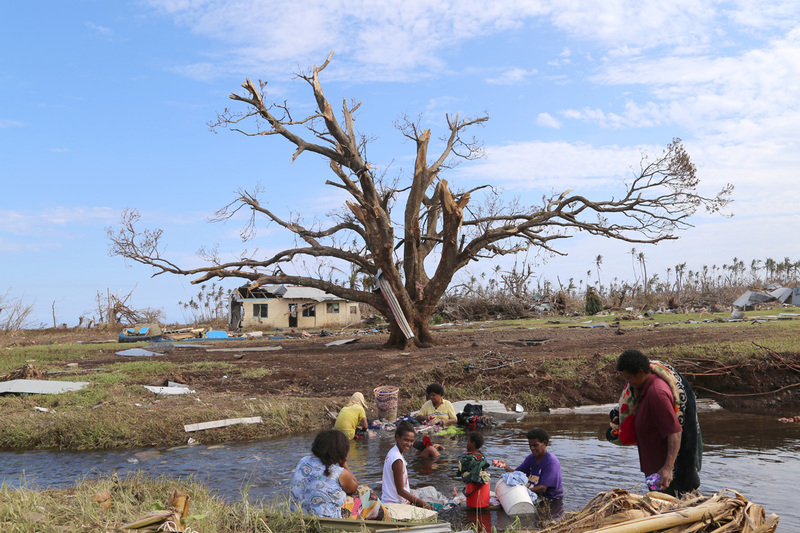 Cyclone Winston smashed everything in its path as it crossed Koro Island, and there are few buildings left standing. Marks can be seen on the nearby hillside where villagers desperately scrambled up to the top of the hill, to get to safety. They carried children and elderly people up the steep hill in order to save their lives. On Koro Island, a family collects emergency relief supplies after the cyclone. UNICEF Pacific is initially appealing for USD $5 million through the Pacific Humanitarian Action for Children appeal. This will be used for water, sanitation, hygiene, education, child protection, maternal and child health and nutrition, according to the Fiji Government’s priorities.